Like all good-hearted people, I CAN’T WAIT FOR THE HUNGER GAMES MOVIE!!! Thankfully, I already have my tickets for Friday night. Readers already know how much I love The Hunger Games books, so you know that if I hadn’t gotten my tickets I might have resorted to desperate measures. Desperation is the driving force behind The Hunger Games narrative. 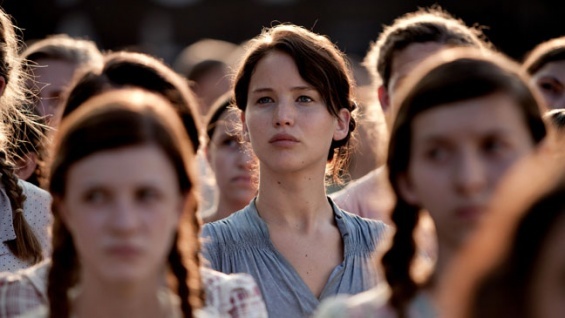 Desperate to save her younger sister, the novel’s heroine (Katniss Everdeen) volunteers for a state-sponsored, nationally televised death match, setting the story in motion. Desperate for food and money, Katniss and Gale hunt illegally in a restricted area outside their district. Kelley Williams-Bolar is headed to an Ohio jail. The mother of two was sentenced this week to 10 days in jail, three years of probation, and 80 hours of community service. Her crime? Sending her two daughters to an out-of-district school. Williams-Bolar lives with the children in an Akron housing project but listed the girls’ home address on school forms as one belonging to her father, who lived nearby in Copley Township, a wealthier area with higher achieving schools. Both Williams-Bolar and her father, Edward Williams, were charged with defrauding the school system to the tune of $30,500. Copley Township authorities aren’t the only ones sending proactive parents to prison. Earlier this month, Connecticut mother Tanya McDowell was sentenced to five months for jail for sending her son to an elementary school in sunny Norwalk, instead of her chronically depressed home city of Bridgeport. And in a tactic worthy of Panem’s President Snow, districts across the country have hired private investigators to surveil elementary schoolers who look like they don’t belong. What on earth could make an 8-year-old look suspicious to school authorities? In Copley Township (86 percent white) and Norwalk (69 percent white), one has to wonder. Across the country, public schools are more segregated today than they were fifty years ago, shortly after the Supreme Court’s Brown vs. Board of Education ruling was supposed to facilitate school integration. Panem authorities clung to segregation in an effort to quell unrest. In the U.S., the authorities’ motivations are not as clear. What is clear is that educational inequality is growing in this country by the day. As long as this trend continues, desperate parents will break the rules to get their children into better schools. Will the authorities try to jail them all? If so, they may soon have a rebellion on their hands.